The full pilgrimage experience will be offered in separate two-day sections between June and September in order to facilitate those unable to do the nine days in one go. The Brigid’s Way annual pilgrimage is being split into sections this summer. In order to facilitate those who have not been able to take time off work and complete the full nine days, organisers have decided to offer the full pilgrimage experience in separate two-day sections between June and September. “We are very excited about this adventure, and we will also be doing the nine-day pilgrimage probably next year, but this is a really good way to experience what it really means to walk Brigid’s Way,” said Dolores Whelan, co-founder of the Brigid’s Way. She feels that the two-day experience will be as enriching as the nine-day one. She added that the steps of pilgrim are both internal and external. “As we walk further and further away from where we started, we are also going deeper and deeper into the centre of our own being, and we are also connecting with the earth,” said Dolores Whelan who has been walking the ancient pilgrim paths and visiting the sacred sites since 1988. She was a bio-chemist and told CatholicIreland.net that she found that she had to approach pilgrimage with the heart and not the head. Nowadays, interest in nature and the environment, and walking and cycling, is strong as is the pilgrimage but it has a different focus and intention. “The awareness of Brigid is rising and it is the need to experience the divine within the land, and the feminine face of God that is nurturing,” said Dolores Whelan, who is a spiritual guide, educator and author in the Celtic spiritual tradition. 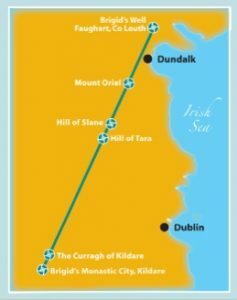 For the past three years, the Brigid’s Way pilgrimage has been walked over nine consecutive days – starting from Faughart, Co Louth and ending at to Kildare town. This year, starting on 2nd-3rd July, the pilgrimage goes from Brigid’s birthplace, Faughart, to Ardee. The weekend takes in Brigid’s Well on Faughart Hill with a blessing and prayer ceremony. It also includes Brigid’s Healing Shrine, spending time at the stream, among the beech trees and the healing stones and on the wild lands of Lisnawilly (part of the ancient pathway) and into Dundalk town. Day two, the Dundalk to Ardee leg of the journey, includes the famous Cuchulainn stone. There will be an enactment of a dialogue, written by Fr Tom Hamill, that might have taken place between Brigid and if they ever met. 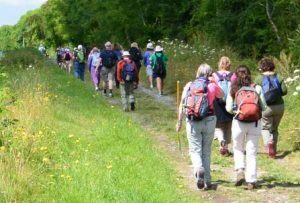 Another section of the walk on 23nd – 24th July leaves from Robertstown and goes through Milltown, Pollardstown Fen before arriving in Kildare town which was the home of Brigid’s monastery and St Brigid’s Well. Over 200 people from all over the world have walked on the annual Brigid’s Way pilgrimage in the summer. On National Pilgrim Path Day Brigid’s Way Walk from Slane to Tara was booked out this year with over 100 participants. Now it close to getting its own signage and app and possibly being promoted under the new Ireland’s Ancient East Route. “We are getting to the point where the Department of the Environment are looking at giving us funds to waymark it, which is really exciting,” said Karen Ward, another co-founder of Brigid’s Way, and former presenter of RTE’s Health Squad. Both Karen and Dolores can list a litany of moments of grace over the tracing of the ancient route and their work towards opening up some of the sacred places and old paths that Brigid once walked. For example, Sally Cox, who owns Lisnawilly estate on the outskirts of Dundalk, astonished them when she shared how Harold O’Sullivan, a local historian, confirmed that a small part of the ancient Brigid pilgrim pathway from Faughart to Kildare passed through her land, and that is now part of Brigid’s Way. The route is based on an alignment discovered by Anthony Murphy and Richard Moore during research for their book Island of the Setting Sun: In Search of Ireland’s Ancient Astronomers. This alignment of sacred sites reflects the Cygnus (Swan) constellation which was prominent in the skies at the time of Brigid’s birth in the 5th century AD. The Brigidne Sisters were delighted to see Brigid’s Way being set up and have often welcomed pilgrims to Solas Bhríde Centre, their new centre and hermitages in Kildare, with refreshment at the last leg of the pilgrimage.